Get a once in a lifetime educational and sightseeing experience in the beautiful Monterey Bay, which is home to a variety of unique marine species. Our experienced skippers are on the water daily and will take you to the best action. Whale watching trips leave at 10am and 1:30pm. Gift Cards and Annual Passes are now available! 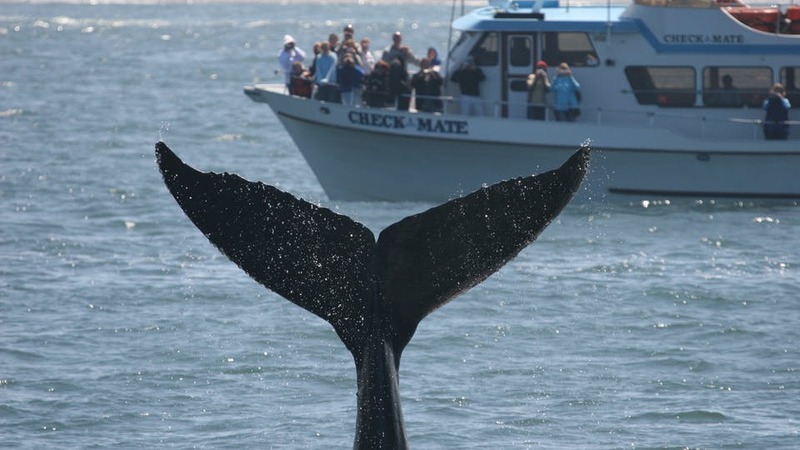 Going whale watching is a perfect activity in the Monterey area and should not be missed. Seeing these majestic creatures in their natural environment is sure to entertain and enthrall everyone. Their sheer size and dominance must be experienced in person to fully understand the magnitude of the wonderful animals we have on this planet. With Chris’ Whale Watching, you’ll get up close and personal with the whales, and may even be splashed as they come up for air and do a somersault for the onlookers. Our trips guarantee whale sightings! This means that you won’t be standing on the deck wondering if you saw a whale or not. You are sure to find what you are looking for when you book a trip for whale watching in Monterey. We made a last minute decision to go whale watching and were lucky enough to grab a seat with Chris' team. I am a big review reader and based on reviews we chose Chris. The tour did not disappoint and lived up to all the reviews and more! We lost count of all the whales we saw. If you want a great experience, use this company. Family owned and operated and some of the nicest and most knowledgeable people you will find. Also, talk to Pete if he's on board. What a great guy that is full of good information and such a pleasant human. Families, couples, and all aboard enjoyed it. The crew were so kind and knowledgeable! They got us to the right place to give our whole group, ages 15 to 71, the have an amazing experience. I appreciate they were able to make accommodations for my father who gets around with a walker...he had a great time! Bring a jacket and maybe some gloves for when the weather kicks up and you will love every minute! We reserved our whale watching tour last minute and chose Chris' Whale Watching because of the promise of a smaller boat and more personal experience compared to the larger companies and we were not disappointed! We got up close to quite a few whales, stayed quite a while, and got an amazing experience. The staff was knowledgeable and informative without being in your face. Even the captain was wowed by what we got to see that day. Everyone on the trip had a great time, kids through older adults. Highlight of our trip. We would go back in a heartbeat. California is home to many such tours, sure. However, when booking with Chris’ Whale Watching, not only are you guaranteed to see the whales, you are also guaranteed an affordable rate that is not heavy on the wallet. Tours for adults run $41, while children at the age of 12 and under can experience these amazing tours for only $26. The tours last a full three hours. Chris has been providing guided tours for over 50 years, longer than any other tour agency on fisherman's wharf. This one in a lifetime experience is both educational and full of wondrous sights. They are led by experienced skippers who travel the Monterey Bay, California coast daily and know exactly where to find the whales at any given time. Beyond whales, you will also see a great number of marine life on this tour. Our vessels will take you into the best sea action possible, where you will see all of the Pacific Ocean’s beautiful sea creatures as they go about their daily activities. You’ll have the opportunity to take amazing photographs and selfies of the whales and other sights. Your entire family will have a great time seeing with their eyes what they normally only see on their screens. Some of the wildlife you are sure to find with the guidance of our expert skippers include: gray whales, killer whales, dolphins, turtles, porpoises, and fish and birds of all varieties!